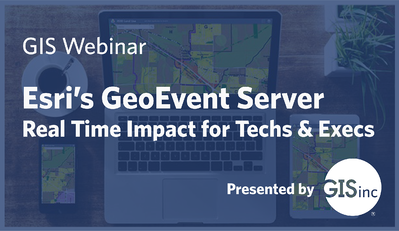 On Thursday January 24th, 2018, GISinc hosted our first GeoEvent Webinar entitled "Esri's GeoEvent Server, Real-Time Impact for Techs and Execs". This interactive session featured GISinc speaker and Enterprise Architect Steve Mulberry, and an array of real-time examples of how you can leverage GeoEvent for your specific business needs. One solution in particular that was highlighted was GISinc's Work Smarter Solution. In conjunction with GeoEvent, WorkSmarter can identify, configure and integrate sensors in the ArcGIS Platform through GeoEvent, and then configure that information to communicate to an asset management or work order system. Are you interested in learning more about GeoEvent? Let us help. View a recording of the live webinar!